Looking for a fragrance that's delightfully crisp, light and perfect for summer? Then call off the search party, because I've found the holy grail. 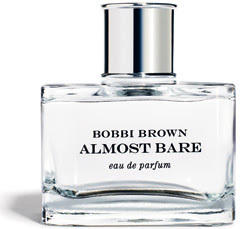 Bobbi Brown Almost Bare has everything I've been looking for in a fragrance for the warmer months. There are some perfumes and colognes that are just too heavy and strong when the temperature heats up ... but Almost Bare is not one of them. A floral gal at heart, I was taken with the fragrance before I even smelled it when I learned of the floral notes within. Essences of Italian bergamot, violet leaves, soft muguet and jasmine petals combine with cedar and amber to create a lovely, comforting scent that reminds me of waves crashing on the shore. Far from being overbearing, Almost Bare is just that -- almost bare. The aroma emanates oh-so-faintly from the skin upon application, never becoming cloying or too powerful. Even the bottle itself is simple and elegant. A clear, square-shaped vial contains the clear liquid and is topped with a beautiful silver cap. At $60 for 1.5 fl. oz., this isn't on the cheap side. But trust this beauty chick when she tells you that it's completely worth it. This is a timeless fragrance that you will want to wear each and every day throughout the summer and even into the fall before it cools down. Hi Jamie. I have very few fragrances that I love wearing, but Bare has been added to my small perfume arsenal. I am also enjoying your First Look Fridays. You find out so much about other bloggers. Who knew that Cindy had a book out? I will have to check it out. Thanks. I have got to sample this fragrance. It sounds really lovely. girl-woman -- I agree, Bare is fab! And thanks so much for the compliments on First Look Fridays. Glad you're enjoying the feature! jen hill -- Yes you do! It's really light and lovely. Let me know what you think!